our accommodation & function deals. Our accommodation package specials have been created to make your stay at Porters Boutique Hotel even more enjoyable. Relax in elegantly appointed guest rooms, complete with plush, classic furnishings and adorned with original local artwork. Enjoy attentive luxury service and full amenities within a stylish, intimate space that reflects the beauty and grandeur of the breathtaking Hawke’s Bay region. Do you simply want to spoil your loved one? Or are you looking for the perfect anniversary gift? Enjoy a luxurious and romantic getaway with us in the heart of Havelock North, with Porters Boutique Hotel’s Romance package. Included is one-nights luxury accommodation for two adults in a premier room with a late checkout of 11am and complimentary valet parking. A special welcome gift for your loved one including a bottle of Haha Brut Curvee Bubbles, Grazing platter a bouquet of flowers and a sweet treat. Enjoy 2 complimentary espresso coffees with breakfast, when dining in Malo Restaurant. Our turn down service is available on request. Wanting to really spoil your loved one? Make it a weekend getaway – add our Escape package for additional nights stay. Or why not upgrade to a premier 1-bedroom suite for $30 per night. Give yourselves extra space to relax with a separate bedroom, free standing bath and kitchenette. Applicable 2019 dates: March – September 2019. Excludes 11- 17th March, 18th – 29th April, 17th – 19th May. Package dependent on availability. Not valid during event periods and long weekends. Platter is to be ordered and will be in your room for arrival. 2 breakfast meals must be purchased in order to receive coffees. The Hotel reserves the right to offer substitute wine if listed wine is not available. Pricing valid for limited time only. Further terms and conditions apply. 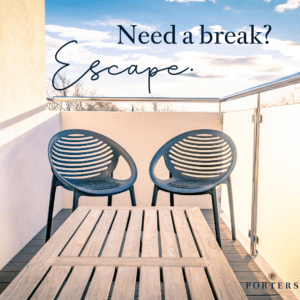 Whether you are looking for a staycation or a vacation. Delight in one night’s luxury accommodation in our premier room including breakfast for two in Malo, complimentary valet parking, high-speed Wi-Fi and late departure of 11am. Looking for an even more luxurious stay? Why not upgrade to our Premier 1-bedroom suite for $30 per night. Give yourselves extra space to relax with a separate bedroom, free standing bath and kitchenette. Package dependent on availability. Not valid during event periods and long weekends. Breakfast to the value of $26.50 per person. Breakfast valid for dining in Malo restaurant and not available for room service. Pricing valid for limited time only. Further terms and conditions apply. $260 Per Night, based on one person. When you are travelling for business efficiency, convenience and a central location are all top priority. When you stay at Porters boutique hotel all of these are guaranteed, as well as luxury and sophistication. With the addition of our conference center, all your meeting needs are covered. You can expect to be impressed. Relax after a long day with one night’s luxury accommodation for one person in a Deluxe Room with complimentary breakfast in Malo Restaurant. Also enjoy in-room access to complimentary high-speed Wi-Fi and undercover car-parking. Do you need a meeting space during your stay? We value our corporate guests and offer exclusive rates for our conference and meeting spaces during your stay. Please enquire for room hire rates when making your booking. Package only available for stays Sunday – Thursday. Package dependent on availability. Not valid during event periods and long weekends. Breakfast to the value of $26.50 per person. Breakfast valid for dining in Malo restaurant only. Meeting room rates subject to change and availability of spaces. Pricing valid for limited time only. Further terms and conditions apply. 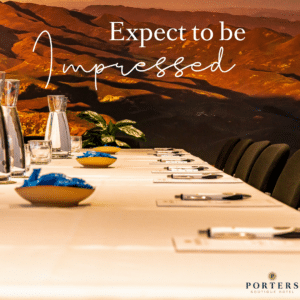 At Porters Boutique Hotel you can expect to be impressed. We have a range of spaces available, modern presentation equipment, High-speed Wi-Fi and a dedicated events team to help with your next conference or meeting. You can book our conference meetings spaces for full day, half day and our boardroom is available hourly too. Digital presentation equipment, high speed Wi-Fi and filtered water. Package dependent on availability. minimum numbers apply. Meeting room rates subject to change and availability of spaces. Pricing valid for limited time only. Further terms and conditions apply. Hire the room hourly from $120 for first hour and $50 per additional hour. 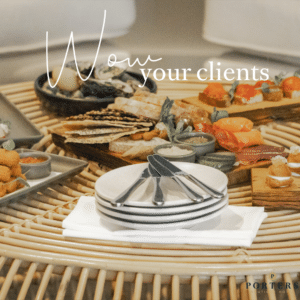 Need professional space to host clients but only for an hour or two? Our Redwoods Boardroom is a sophisticated space equipped to suit your needs and ideal for small groups. Package dependent on availability. Meeting room rates subject to change and availability of spaces. Pricing valid for limited time only. Further terms and conditions apply. Needing a professional space to host clients or are looking for a dynamic space where you can hold a presentation with networking afterwards? Our Triple Peaks function room is the perfect option for reception style gathering for groups of 20 – 50 people and our 2 hour cocktail package is the perfect choice for your next business function. Our Triple Peaks function room for 2 hours + access up to 1-hour prior for your personal set up. Add a bar to your function, see our beverage packages for options. Want to customise the space? Talk to use about hiring some stunning Flock Events Furniture to really impress your guests. Food and beverage service maximum of 1 hour for minimum of 20 people. Platters Served grazing style in your hired room, maximum 2-hour use of function space. Package dependant on availability. Meeting room rates subject to change and availability of spaces. Pricing valid for limited time only. Further terms and conditions apply. At latest last drinks served at 8.30pm for a 9pm departure of all guest. Finish your day on a relaxing note and give you delegates a chance to network with each other. Our ‘wine’ down special is the perfect way to end your meeting or conference. Enjoy delicious shared Charcuterie and Seafood Platter and one glass of bubbles or standard beer per person. Served grazing style in your hired room, maximum 1-hour duration. Package dependent on availability. Meeting room rates subject to change and availability of spaces. Pricing valid for limited time only. Further terms and conditions apply. Note: Terms and conditions apply and all packages are dependent on availability at the time of booking. For more information on any of our specials our team would be more than happy to talk to you.